Prior to ICSC RECon, David Perlmutter wrote an article, “What's Wrong with ICSC RECon?,” which challenged ICSC’s leadership to make Wednesday at ICSC better than it has been, and how the #LetsGetSmart17 Speaker Series was a grass roots effort to do just that. Liz Holland, the CEO of Abbell Associates, a real estate investment and management company based in Chicago and 2016-2017 Chairman of the International Council of Shopping Centers (ICSC) accepted the challenge. During her term as ICSC Chairman, Liz has focused on whether internet sales are really killing brick and mortar stores, as so many media reports lead us to believe. In her talk, she analyzed whether online sales are really killing physical retail to the extent that it is so often presented and how the internet is changing people’s shopping behavior. Liz began by discussing a talk that she had with representatives from the U.S. Census Bureau. Their meeting was to analyze the data that the Census Bureau has about retail. The meeting revealed that the Census Bureau’s data does not reveal as much about the real estate as was hoped. The data was more about the economy and information that could benefit federal policy. This is not the information that is most beneficial for the retail industry. Moreover, this information is often misrepresented (unintentionally or not) in a way that makes the retail industry seem to be doing worse than it actually is. To explain why the data was insufficient, Liz provided the example of the often-cited statistic that 9.2 percent of retail sales are no longer coming from brick and mortar stores. This number may sound relatively large, but when broken down into its component parts, it becomes less intimidating. For example, a tenth of the number accounts for shipping costs, like FedEx and UPS. Mail order accounts for a further third of the statistic—and half of this is for mail order prescription drugs. These numbers, according to Liz, put serious dents in the idea that ecommerce is rapidly replacing traditional retail. Even Amazon, Liz noted, barely makes a profit from its ecommerce business, and these profits have been shrinking in recent years. In the past couple of years, Amazon has entered the brick and mortar retail business, opening large stores in major cities. Liz discussed at length the Amazon store in Chicago, her home town. The 6,000 square foot location uses the vast troves of digital marketing data from its website to know which books to stock. With the demographic information about the online book choices of the area, Amazon can stock probably only a quarter of the books stocked in a traditional bookstore. This creates synergy between data and physical retail and could prove to be a powerful force in retail going forward. While Amazon’s physical locations have a long way to go before matching the company’s digital revenue streams, the brick and mortar stores “create customer loyalty and brand identity,” according to Liz. Ulta, a chain of beauty stores, is another example of a company that utilizes digital technology at its retail locations to improve the customer experience. If a customer who is a member of the frequent buyer program logs into the store Wi-Fi, they will get a notification telling them which of their previously bought items is on sale. As these examples demonstrate, the internet is not killing brick and mortar retail as much as it is changing how retail is done. In the past, said Liz, “there used to be two kinds of shoppers: there were hunters and there were gatherers. Hunters go into a store knowing what they want, buy the product, and leave. Gatherers have a less purposeful shopping mindset, going store to store while looking at a broader selection of products. After lots of looking, gatherers finally make their purchase. 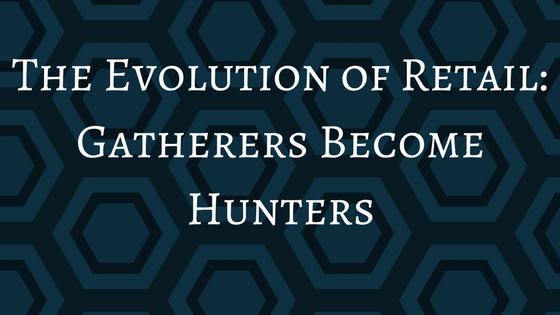 The internet has led to many more people “hunting” rather than “gathering”. People can suss out what they want beforehand online, and then go shopping for the specific product they they know they want. Consumers are now “channel agnostic”, according to Liz. They care much more about the product that they buy more than where they are buying the product. Liz cited Homeplus, a supermarket chain in South Korea, as a model example for integration of digital technology in brick and mortar retail. Homeplus plastered subway stations in Seoul, South Korea with pictures of the shelves on their grocery stores with QR codes next to each item. People could scan the QR codes with the Homeplus app on their phone to put items in their digital shopping cart. Then, they could choose a time to pick up their items from a physical store or have the groceries delivered to their home. Liz emphasized that this very novel idea was done completely with very much established technology, meaning something like this is very possible in the United States as well. After Liz finished her talk, the audience engaged her with various questions about the ICSC, large malls, and using social media to reach millennial users. The audience was particularly interested with Liz’s knowledge of millennials. They discussed how the rise of social media has made everything part of people’s “personal brand”, making people identify more with the things they buy. This further accentuates people’s “hunting” mentality. In parting, Liz shared some thoughts on how best to reposition retail for the future. As millennials are more likely to shop online then their older counterparts, they crave shopping experiences. So, popular stores for millennials, and growth sectors as millennials become more established consumers, are things like craft breweries, bowling alleys, and movie theaters.